Today we ran out on the Boss Lady to the inshore lumps to setup on the chunk again. We setup on the drift at first light and had no action. We reset for a second drift and had a tuna hit a spot suspended from a kite, but the tuna missed the hook. Shortly after we hooked into a Mahi on a free floating chunk that broke the 10# mark. We had great bait marks, and this continued throughout the day. We marked sand eels, squid, and sardines. 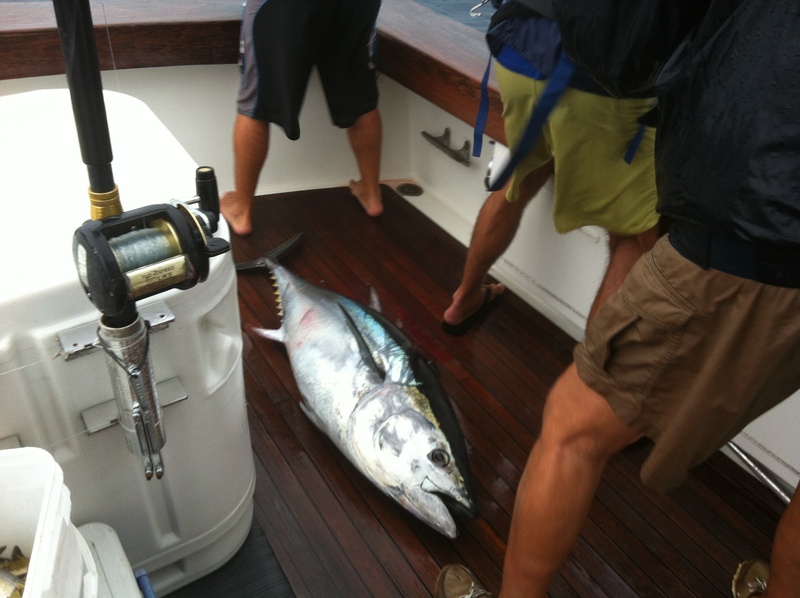 Things remained somewhat slow until we were able to get hooked into a nice tuna which hit the deck. We were able to hold that school and pull in a double header. The fish were really finicky and we could only get our bites with light leader. Towards the end of the day we got one more tuna to cap off a solid day of fishing. Slow but steady pick. There were a few boats that had some wahoo on the chunk, hopefully we can get into some of them tomorrow. I captained/guided lady angler Maureen Klause today on her boat Trade In with Mate Anthony Tsapis. 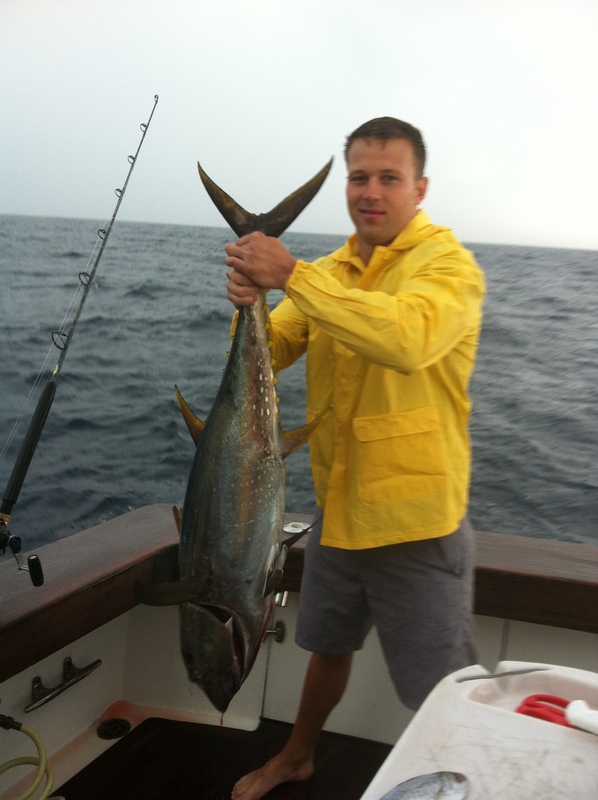 We stayed close today and tried a different area looking for a yellowfin over 40 pounds on 6# test. The water temperature was 78.2 degrees where we setup, and our first drift over the lump was unsuccessful. I decided to look aroud for bait all around the lump before dropping the anchor. After about 30 minutes of riding around I found a solid baitball and sand eels on the bottom in 140 feet, and we setup on the bait. It didnt take long before we got our first bite on a butterfish chunk, but unfortunately it broke off on the initial run. We had a long lull before our second bite on a spot, but it didn’t come tight. Then we finally got teh fish we were looking for that ate a spot suspended from our outrigger. Game On! Maureen fought the yellowfin for just under 2 hours, and we got to see teh fish twice, but in the end the tuna just wouldn’t come up and it broke off. The long fight had taken the toll on the light tackle, and that ended our day. I am headed out on the Boss Lady again tomorrow and hopefully we can get on em! I fished on Boss Lady and we made our way out to the lumps around the 30 line to setup on the chuk. We got setup and immediately were hooked up into a tuna. While we were on that one we had two more bites, but neither stayed hooked up and we lost the fish we had on. Rough start, but that is the chance you take using light leader to get the bites. We had a stiff wind against the tide making things a little snotty, and with the slow action we decided to pick up and make a radical move. Unfortunately we had a mishap and wound up getting some rope wrapped up in the prop and the shaft. After an hour or so of taking breaths and going under the boat, I was able to free it up enought to get teh majority out, and the boat did the rest of the work. Captain Bill May moved us to a different area and we had no bait marks. Things were looking grim, but we pounded it out, and it paid off at teh end of the day. We ended up putting 2 nice yellowfin and 2 mahi in the boat. We had a few more tuna hooked up, and all bites happened in about 30 minutes and all came from a live spot suspended from a kite. Watching the tuna come up after the spot splashing on top of the water was wild. It was great to pull it out at the end of a long day. I captained the 56′ Viking Nightwind to the Hot Dog for a pre fishing trip. We wanted to make sure all of the kinks were worked out before we fishing the Viking/Ocean Showdown Tournament held by South Jersey Tournaments. It was a short day with 3 hours of fishing, but we managed to get 5 bites on tuna. It was every bit of 5 foot out there, but there was still a small fleet of boats looking for tuna on the chunk at the hot dog. I did not mark as much bait or tuna like I had been at the Dog the past two weeks, and the water temperature dropped from 78.5 to 74.5, but we still got our bites and came home with fish.